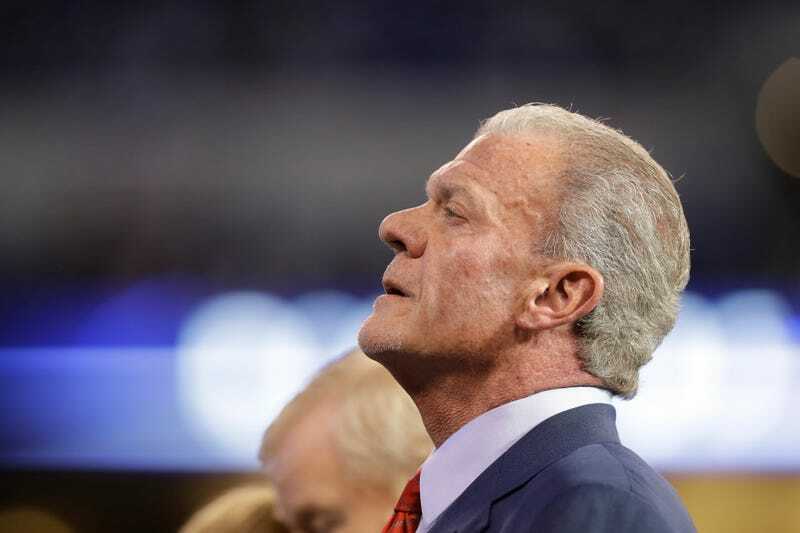 Where Is Jim Irsay And What Is Going On With The Colts? Colts head coach Chuck Pagano and GM Ryan Grigson have spent the last few seasons conspiring to waste Andrew Luck’s prime and turn their team into one of the saddest sacks in the sad-sack AFC South. It’s reasonable, then, that everyone was prepared to see some blood spilled after the season ended, but so far there has only been silence out of Indianapolis, and it’s starting to get weird. Reporters have made multiple pleas for comment from Irsay in the past 24 hours, to no avail. The team has indicated there are no plans for any media availability Tuesday. That can mean one of two things: Everything is as it appears, and nothing is changing. Pagano and Grigson received contract extensions through 2019 last year, which means there’s technically nothing to address if no changes are made. Or, the silence could suggest things are still very fluid and no final decisions have been made. That could mean Irsay is mulling his options before making anything official. The Colts have met their season-ending media obligation. The NFL requires either the coach, general manager or owner to address reporters after the season’s conclusion. Pagano’s news conference on Monday met that standard, meaning the Colts are in the clear as far as the NFL is concerned. This is genuinely weird. Surely Irsay understands that public perception is that Grigson and Pagano are on the hot seat, and if he plans on keeping them around there’s no reason not to just come right out and say so. If he’s planning on axing one or both of them, waiting a few days to do so isn’t a very good idea, either. Black Monday exists because NFL teams know they have to jettison their bad coaches quickly so that they can start interviewing replacement candidates—many of whom have scheduling constraints because they are getting ready to coach in the playoffs—as soon as possible. Maybe Irsay is trying to bide his time and see which coaches are available before deciding what to do with Pagano and Girgson, but the longer he waits the more likely it is that every good candidate will get snapped up by other teams before he makes his decision. All I know is that I am unreasonably excited by all the ways in which Irsay could screw this up. Will he wait too long to pull the trigger and end up with Rob Ryan as his head coach next year? Will his refusal to give Pagano and Grigson a vote of confidence lead to even more intra-organization dysfunction? Will he forget who he is for a few hours and accidentally trade Andrew Luck? Stay tuned!